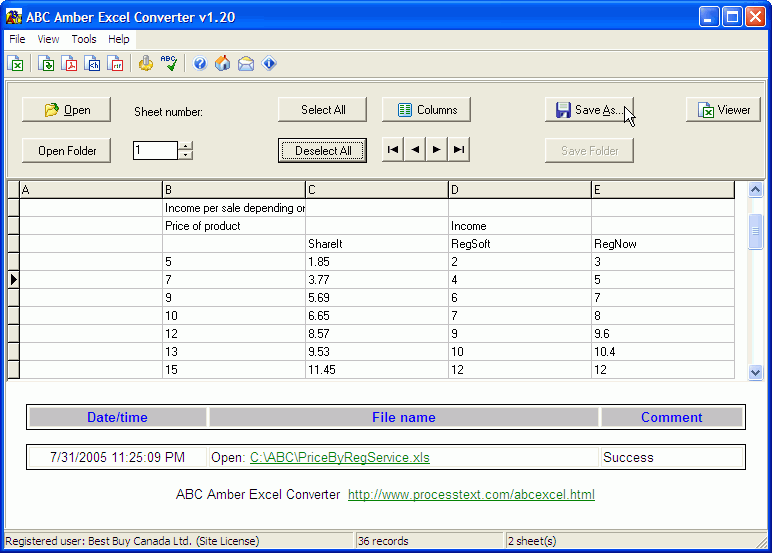 UDM Downloads > ABC Amber Excel Converter! ABC Amber Excel Converter was developed to help you convert your XLS (MS Excel) files to any format you wish (DBF, CSV, XML, PDF, HTML, CHM, RTF, HLP, DOC, and many more) easily and quickly. The software supports a batch conversion, a run from command line, more than 50 languages. Batch conversion ability allows you to convert a unlimited number of XLS files at a time. Important note: MS Excel does not need to be installed. Partial Features List: - reads XLS files (does not require MS Excel to be installed); - exports to CSV, DBF, XML, PDF (does not require Adobe Acrobat to be installed), HTML, CHM, RTF (MS Word doesn't need to be installed), DOC (Word 6.0/95/97-2002), WRI (Windows Write 3.0/3.1), WPD (WordPerfect 5.0/5.1 for DOS/5.x for Win/5.1-5.2 secondary, 5.0 secondary, WordPerfect 4.1/4.2), MCW (Word for Macintosh 4.0-5.1), WPS (Works 4.0 for Windows, Works 2000, Works for Windows 3.0), DOC (Word 2.x for Windows, Word 3.x-5.x for MS-DOS, Word 6.0 for MS-DOS), SAM (Ami Pro 3.0), WSD (WordStar 4.0/7.0), RFT (IBM's RFT-DCA), Clipboard; - supports batch conversion (registered version only); - command line support; - supports multiple charsets; - easy to use and easy to set up; - supports multiple PDF export options (document information, 40/128 bits PDF encryption, PDF security options, page size, page orientation and page margins, resolution mode, compression mode, viewer options, embedding style); - supports multiple CHM and HLP export options; - multi-language support; - more.